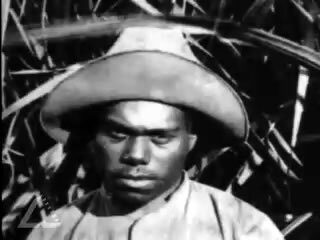 Video clip synopsis – Phyllis Corowa's father and grandmother were taken from Vanuatu to work on a Queensland sugar plantation. Broadband MP4 thesugar_bb.mp4 (14.3MB), suitable for iPods and computer downloads. The Sugar Labour Trade is an excerpt from the film Sugar Slaves (56 mins) produced in 1995. Between 1863 and 1904 about 60,000 Pacific Islanders were transported to Queensland, where they toiled to create the sugar plantations of the far north. Some of these islanders moved there willingly on the promise of income, whilst others were kidnapped from their island homes. Pacific Islanders were ‘recruited’ from various islands including the Solomon Islands, Vanuatu (then the New Hebrides) and the Loyalty Islands of New Caledonia. This human trafficking is euphemistically known as ‘blackbirding’. The Islanders worked in harsh conditions in the Queensland sugar fields, some in conditions akin to slavery. According to the Department of the Premier and Cabinet, *conditions varied from plantation to plantation depending on how considerate the owners and overseers were. However few Islanders escaped some form of physical or mental violence. Abuse of the Islanders included being beaten, being deprived of food or leisure time, medical neglect and sometimes separation of married couples. In the late 19th century trade unions in Australia were fighting for workers’ rights but the Pacific Islander workers of Queensland were banned from organising as a group. They were forbidden by law from striking and from leaving their place of employment. Workers who left without permission or ‘absconded’ faced three months imprisonment. Because the Pacific Islanders were paid so poorly compared to other unskilled workers in Australia, they were seen by some as a threat to employment. Opposition to these non-white immigrants came in some cases from those involved in the labour movement. They did not object when the Commonwealth decided to deport most Pacific Islanders between 1904 and 1908 as part of the implementation of the Immigration Restriction Act 1901 (often referred to as the ‘White Australia policy’). In the southern states of Australia there were others, including those in labour movement, who took a different view and called for fair treatment of the Pacific Island workers. After Federation a few thousand Pacific Islanders were not deported and were permitted to remain in Australia. Today north Queensland is home to more than 20,000 of their descendants. What kind evidence could Phyllis Corowa have drawn upon to find out about the life of her maternal grandmother – or to ‘piece all these things together ‘as she puts it? Working Life in Australia—include information on who she worked for, what she did and what working conditions were like for her. Using information provided in the video clip, compare the rights of the Melanesian workers of the Queensland Sugar Plantations like Elizabeth Oba to those of other workers in Australia. What was controversial about it and why was it opposed? Where was most opposition located? What were the arguments for the continuation of the system? Through an internet search – find out further information about the Immigration Restriction Act 1901 mentioned in the background notes above. What is this Act commonly called? What were the concerns and pressures current at the time the Act was drafted that led to it being supported and subsequently being passed by the parliament? What happened to the islanders who lived in Queensland as a result of this Act?